Kicker ramps are small ramps used by skaters to get a maximum height when doing tricks. These ramp plans are for aggressive skaters who have moved on from bank ramps and are looking for some fast action. The boards are set steep and it launches you in the air in a flash. Kicker ramps can be easily made at home without any extensive woodworking experience. 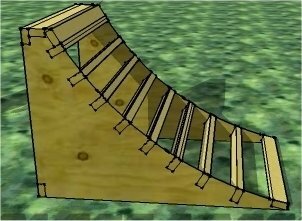 Build this ramp that doesn't need very much wood. It is 6 feet long and 4 feed wide.